Bio Break site news: Blogroll updated! So I’ve added several new blogs over the year (and especially for Blaugust), but I hadn’t culled the list until today. Thus, what’s over there are all blogs that are more or less currently in operation. Ones that have gone dark or offline have been removed. As always, please let me know if I’ve overlooked your blog (that meets the above qualifications) or if you’ve started writing again and I had previously taken your blog off of the list. MMO-wise, there’s no doubt that Guild Wars 2 stole the show at PAX Prime this year — and that’s even with some big SWTOR companion talk, a new Trion game, and other various titles vying for attention. With the game’s anniversary, the announcement of the October 23rd launch date, the revelation of raids, and the release of the core game for free(ish), I could hear gamer eyeballs snapping back to Guild Wars 2 from all over the world. And you know what? Good for it. Even if it’s not in my rotation right now (nor will be for the foreseeable future), I bear no ill will for the game. As I said when Bree told me that this news made her miss the game, I miss things about Guild Wars 2 but not necessarily the game itself. I miss the beauty of it, the neat animations, the casual-friendly nature, and certain systems. But I feel that there’s this intangible line marking true fans from the rest of the crowd, and I’ve never been able to cross that. I did log in to get my third anniversary gifts on my engineer. The choice of dye was nice indeed, and now I have yet another level booster if I ever want to power-level another character. Even with a certain media outlet breaking embargo on some of the big news, GW2 had a strong showing at PAX. Raids… eh, that wouldn’t have interested me if I was still playing. The big world boss fights weren’t major attractions, so I can’t imagine raids pulling me in. But the date announcement and giving away the core game are both really good moves on Anet’s part. Were there a lot of people not playing Guild Wars 2 who really wanted to yet — in the span of three years — never ponied up for the game? Eh, at least it’s a good permanent trial and will help to boost sales for the expansion. This also means that October is looking hecka busy. We’ve got SWTOR’s expansion right around then, and I’m willing to bet that WildStar’s F2P patch will land that month too. Plus, there’s all the Halloween content and whatnot. 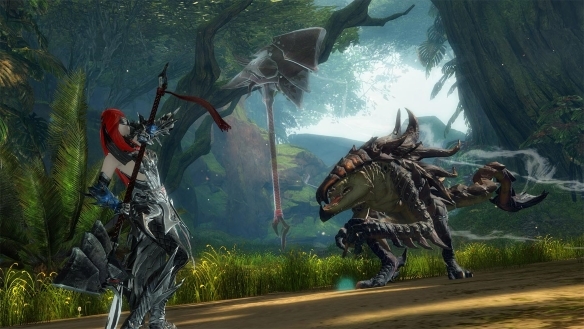 October is the new September for MMOs? So today is the last day of Blaugust, the community blogging event initiated by Belghast with the hopes of encouraging bloggers to establish a once-a-day posting pattern for an entire month. I am really impressed by how many people stuck out the entire month and how many more made a genuine effort. Lots of great posts this month, and I would love to see these writers take their increased frequency and keep it going through the fall. For me, it wasn’t much of a change than how I normally posted, although I did make one tweak to the format: I started putting my retro gaming posts on the weekend. I really like that, so I think I’ll keep that going from here on out. I don’t get time to poke around a retro title every day, but enough for two posts in a week? No sweat. Way to go, Blaugust writers! Was a lot of fun writing alongside of you all. 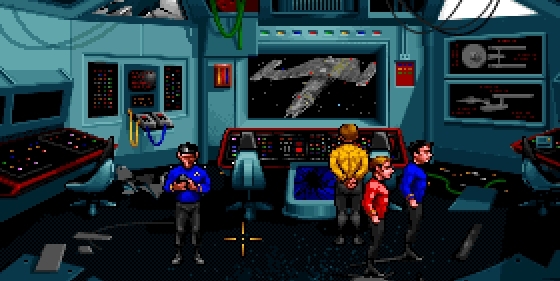 A year after the incredible Star Trek 25th Anniversary came out, its sequel, Judgment Rites, was fast-tracked. By all accounts, it was a marked improvement on the first game, utilizing CD-ROM for better graphics and voice-over (the first game was later reworked into a CD-ROM version). Judgment Rites is also notable for being the last performance of DeForest Kelly as Dr. McCoy before his death in 1999. I’m genuinely excited to go through this game because, unlike 25th Anniversary, I have never played it. Honestly, I don’t know if I knew it existed back in the early ’90s, which is a shame because 1993 was near the height of my Star Trek fanaticism. With eight episodes, this is no slapdash sequel, so let’s get to it! 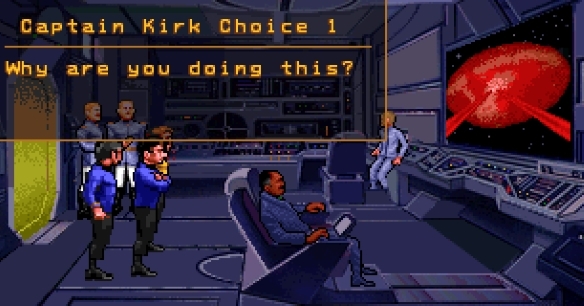 Here’s one very welcome change for the sequel: You can choose a difficulty level for space battles including the option to turn them off completely and play Judgment Rites as a 100% adventure game. I have never clicked an accept button so hard. Holy CRAP this episode starts out with a bang. As Kirk is making a mundane log, a tear in space spits out a heavily damaged Alexander. Coming right from 25th Anniversary, I can already tell that the look and sound of this game are a step up. The captain hails the Enterprise and says that he’s from eight days in the future where the entire Federation has been destroyed. But he’s unable to say more before the Alexander blows up. Would’ve been nice to beam them over, wouldn’t it? Guess we’ll have to back-track the ship and see what it was up to in the previous week. 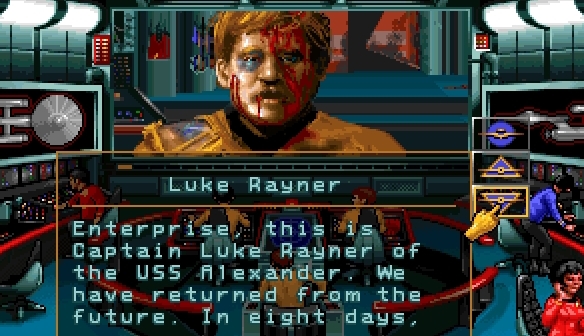 Also: “Luke Rayner” is the coolest captain name ever. 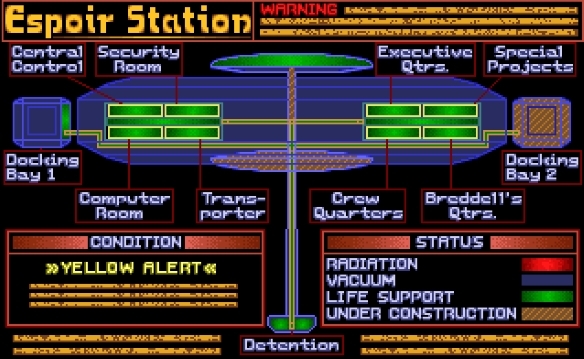 The Alexander apparently came from Espoir Station, and when the Enterprise arrives the station commander says that Elasi pirates (the bad guys from the first game) have been harassing the station as of late. Kirk beams down with the away team. The second Kirk arrives, the station commander traps the Enterprise in a tractor beam overload shell thingie and threatens to destroy the ship. I would have given anything for Spock to slap the guy upside the head and calmly reach down and turn off the beams. 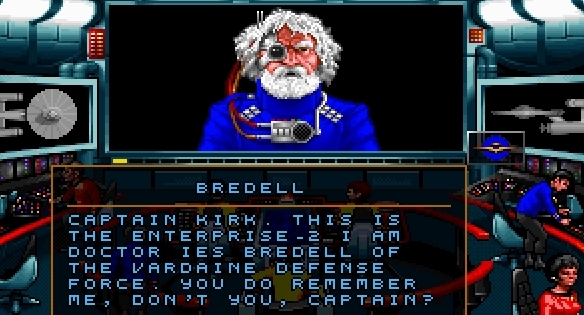 The mastermind of the trap is revealed: It’s Dr. Breddell, the cyborg dude who was controlling the Enterprise-2 from the end of 25th Anniversary. Apparently he survived and is hellbent on taking revenge on Kirk. And revenge right now is… merely throwing him in the brig. Kirk talks the security officer into freeing them, since Breddell had the officer’s father executed a while back for trying to let the Federation know about the illegal ship program. I also love stunning obnoxious technicians who are standing in the way between me and my precious 3-D chess game! Kirk and Spock then play out the remainder of the game — a nice nod to their matches in the TV show — with humorous interaction between the two. The conversation in this game seems more natural, I must say. 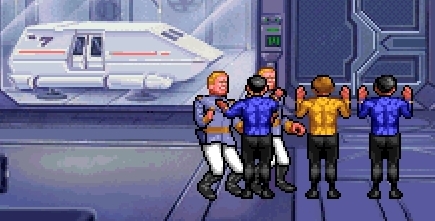 Taking over the station room by room is quite enjoyable, especially when Spock takes out two guards at the same time with the Vulcan nerve pinch. So I found out what happens when you die in this mission (after some gas knocked my team out). A weapon above the station fires beams out in all directions and one hits Earth (! ), exploding it. That causes the time rift and knocks the player back to the beginning of the mission when the Alexander comes out of the rift. Neat! 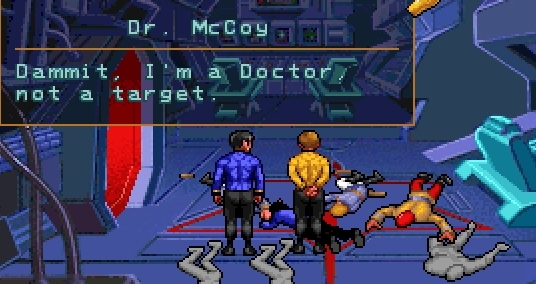 My favorite thing about this mission is that McCoy invariably is the first to get stunned any time there’s a firefight. And he takes this about as well as you might imagine. Poor guy. All space stations have murderous four-armed beasts roaming around, right? After a lot of work — this is a very, very long mission — Kirk confronts Beddell in his adorable quarters. I love the dart board with Kirk’s face on it. The proto-event weapon is destroyed by the Enterprise soon after, and the temporal paradox involving the Alexander is resolved. Hooray for us! Wow, can’t believe we’re already at the seventh and final episode of the game! This is Vengeance, and it’s notable because the CD-ROM version expanded what was originally a really short mission. It’s also notable for having the toughest and most annoying ship battle of the game, but more on that in a bit. The episode starts out dark: The Enterprise is coming to the aid of the Constitution-class Republic, which has sustained horrific damage and only has two survivors. Dang, look at that ship up there — amazing it’s still intact. Looks like Cookie Monster took a bite out of the hull. No clue who did this, however. The away party beams over to a bloodbath — a bridge filled with nothing but corpses. Kirk and company stay to sort things out while the Enterprise dashes away to help a trade vessel in distress. Well, that bodes well. Looking through the computer records, Spock reports that the Republic was attacked… by the Enterprise herself. Weird. The sole survivor — a former classmate of Kirk’s — confirms that the Enterprise attacked the ship. She dies soon thereafter, leaving the away team on a gutted ghost ship. 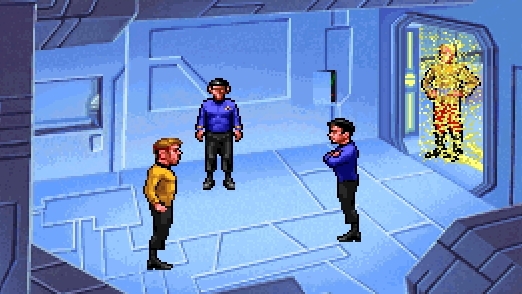 Now in the original version, the team beams back to the Enterprise here and the final battle begins. 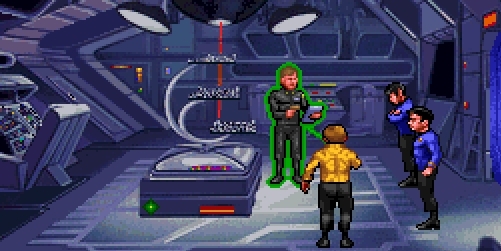 In the CD-ROM version, however, there’s a lengthy quest to explore the heavily damaged Republic and restore some of its power and functionality. Kirk gets to blow a few things up with his phaser, so he’s happy. An Elasi ship decloaks (!) just as the team gets the Republic’s power back. Unfortunately for Kirk, only one system can be powered at a time. Shields, mayhap? Kirk delays for a bit while the team prepares some subterfuge. This involves beaming a red shirt to the torpedo bay, where he’s surprisingly not killed, and then tricking the Elasi to lower their shields and blasting them hard. That’s hardly the end of the matter, of course. The whole Republic attack was a setup to get the Enterprise here, as the Enterprise-2’s captain is a longtime foe of Kirk’s. I don’t remember him from the show, but who knows. Talk talk talk, blah blah blah, time for a big showdown. So here’s the final battle, and as I’ve said before in this series, Star Trek 25th Anniversary’s ship combat is subpar at best. So to fight another Enterprise PLUS two Elasi ships seems just cruel. With the battle won, the mission — and the game — comes to a decent end. 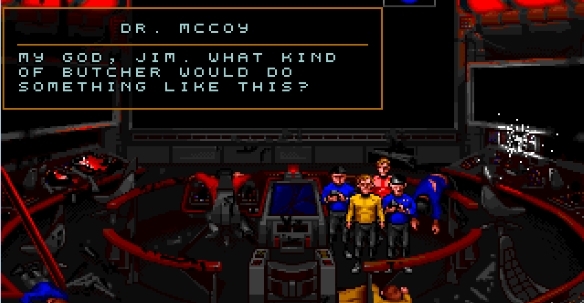 Except for that final fight, this game is hands-down one of the best Star Trek games that was ever made and offers so much in value and replayability. 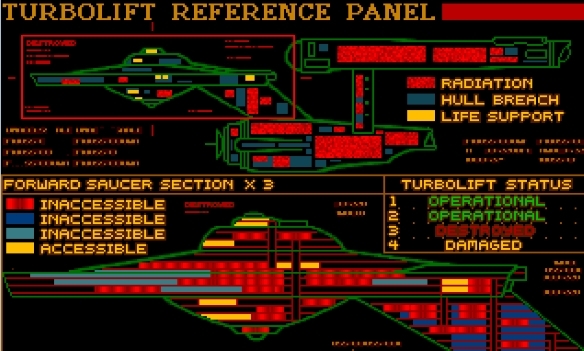 Someone noted that if you take the time to peruse the in-game Enterprise computer, you’ll even find that there are logs on tons of Star Trek references. So that’s Star Trek 25th Anniversary! Stay tuned for tomorrow, as I’ll dig into its sequel, Judgment Rights. Why can’t I get into SWTOR’s housing? The other day I was talking with MOP’s Jef, who was saying how he had just spent a few hours doing nothing but customizing his SWTOR house. I don’t find the concept of playing virtual dollhouse odd at all, but it made me think about how little I feel the urge to get into SWTOR’s housing system, even though I’m usually a housing nut. 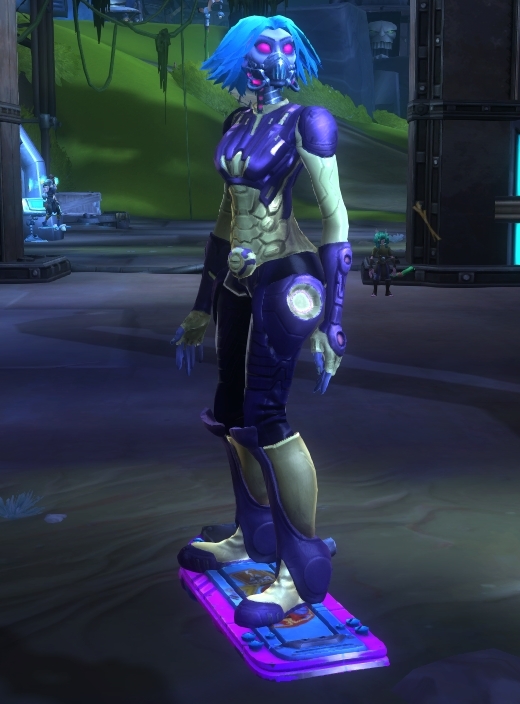 I mean, housing drives 80% of my activities in WildStar. I run daily challenges for decor, I quest for money to pour into my house, I fight mobs hoping that a FABkit or a housing item will drop. I love flitting back to my private island and customizing my pad. Then again, what is appealing in one MMO isn’t necessarily going to appeal in another. I don’t universally like all MMO pet classes even though I’m drawn to those types. Some games just feel off or aren’t satisfying. I loved dungeon running in RIFT but will never do it in WildStar because the combat and difficulty is different. (1) There’s no convenient “go to house” button on my screen. Yes, this is the epitome of laziness, but the fact that I have to open up a menu and then click another button to teleport to my house keeps home visitation off my radar. In LOTRO, RIFT, and WildStar, that house warp button is right on the screen at all times. 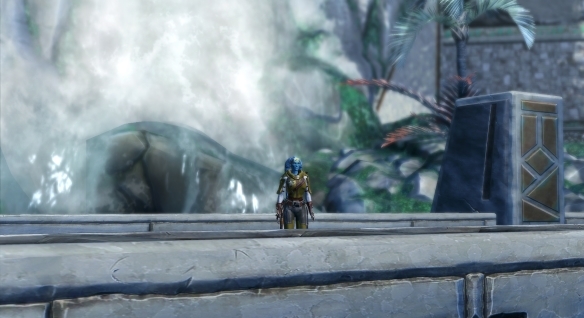 Why can’t we have an ability that does that in SWTOR the same as the other teleports? (2) I’m not the biggest fan of the hook system. Listen, it’s great that SWTOR added housing, and you will not get any argument from me that its version of hook-type housing is better than what LOTRO did. There’s more wiggle room to position stuff, to be sure. On the other hand, it’s still a hook system with far more limitations than an “anything goes” system that I’ve enjoyed in RIFT, WildStar, and EQ2. And having hook squares only allowing certain types of decorations to be placed annoys me greatly. This is my house, and if I want to put a couch on the ceiling, I should be allowed to do so! (3) I never get housing drops while questing. Where does everyone in SWTOR get all their housing stuff? That’s what I want to know. It certainly isn’t from questing and killing mobs, because I think I’ve only seen one or two housing-related drops ever since that expansion came out. I would have thought that housing stuff would be great quest rewards, but again, never see them. Instead, I’m guessing that most everyone either buys stuff off the vendor, the cash shop, or the GTN. That’s practical, I suppose, but it takes the fun away from the game randomly handing me a fun item and then prompting me to go add it to my house. Plus, I’m never even reminded that I *have* a house when there are no drops. Yes, I understand why BioWare couldn’t allow us to customize the interiors of our ship for cutscene purposes, but I say that the devs were short-sighted in that regard and should have made it work anyway. For my character and for me, my ship IS my home. I have a convenient teleport ability to get there. I use the ship all the time and enjoy its practical services, such as accessing cargo space. It’s small and neat and the place I always go between missions. That’s the home I want to decorate with my trophies and gadgets. My apartment? It’s like a summer cottage that I occasionally visit but don’t really need. Sure, I can throw in some interactive services like mail and whatnot, but there’s nothing it can do for me that fleet can’t. I’m not so ostentatious that I feel that I need a second home in a game. Anyway, I told you these were piddly reasons, but if I’m being honest, they’re why SWTOR’s housing gets very little interest from me. I’m not writing it off entirely; I should invest some time in sprucing up my pad at some point. It’s just not on my radar. Update: Ack, I totally forgot a major pet peeve, so consider this #5. The interface to select housing items is really, really wonky to work with. You can only see a few items per page and have to wrassle with filters (hook type, etc.). I just want a BIG HONKING LIST of what I have at my disposal in an easy-to-read format. Yesterday Funcom announced the secret project it’s been working on — no, not another MMO, but instead a single-player horror game called The Park coming in October. A single-player horror game that is set in what looks like The Secret World’s haunted Atlantic Island Park. It’s not my imagination, either. The page and video shows the exact same ferris wheel, rollercoaster, and “octotron” that TSW players know so very well. However, the park also looks different, more fleshed out and with a slightly different layout (a ring of water around the Octotron, for example). I really did not expect to see any sort of TSW spin-off, ever, but I’m actually kind of excited over this. It’s funny — just a week ago I asked the MOP community if they’d like to see The Secret World preserved as a single-player game, especially in light of Funcom’s dire financial situation. My feeling was that (1) I love TSW’s unique setting and story so much that anything to preserve it in the case of a studio shutdown would be welcome and (2) TSW’s adventure game nature lends itself better to a theoretical single-player conversion than most MMOs. And more TSW, even as a spin-off, is welcome. 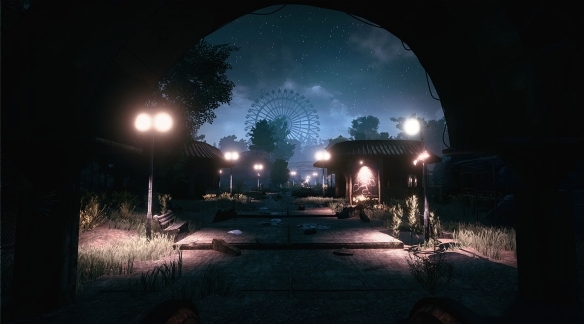 I think the choice of the haunted amusement park is a good one, as it’s one of the most memorable settings from the game (and that is saying something, especially for Kingsmouth). There was a lot of potential left in that area, and I would be excited to see an expanded version of the park. Now I’m thinking that this is most likely a prequel to the events of the MMO. The description makes it sound as though the park is in active operation — after all, the mom brought her son there for a fun day — and the screenshots do not show it as decrepit as it’s become in TSW with the decades’ long shutdown and the influence of the Fog. Another thought is the possible connection of the Bogeyman and the park’s attacks on children. Anyway, pleasantly surprised to see this coming and I can’t wait to try it out! I wanted to share that outfit/color scheme that I was talking about earlier. And you can’t see it, but she has these awesome bulky pistols that look great with the robot armor theme.